1. In what year did your company begin operation?The Caveman Bakery was founded in May 2009, and began production around October of that year. My definition of success keeps changing! When I first started, I felt “successful” when people other than family & friends began purchasing the cookies online. At that point, I felt (somewhat) comfortable leaving my job as an attorney to begin working on Caveman Cookies full time. After that initial stage, “success” became outgrowing production in a commercial kitchen, and moving production to a copacking facility so that I no longer had to wake up at 6am each morning to produce the cookies myself. Then, after some time at the copacking facility, “success” became when a Whole Foods region took on the cookies and when Caveman Cookies got a mention on Dr. Oz! So, given that “success” has consistently been a moving target for me, I can’t say that I’m there yet! My next measure of “success” will be getting national distribution, since although Caveman Cookies are currently available across the US (and several other countries) distribution is focused heavily on the East Coast. 3. How long did it take to be successful? What challenges did you face in establishing your company? There were a number of challenges in creating the Caveman Bakery and getting to where I am now. Early on, the greatest challenges had to do with navigating regulatory issues that I knew nothing about. Luckily, I was fortunate enough to live in NYC where we had a great resource called The Entrepreneur Space in Long Island City. 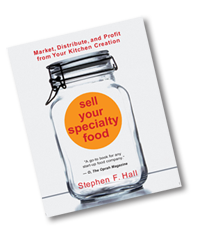 The owner of the Entrepreneur Space was an incredible resource for new specialty food business owners; she put me in touch with everyone I needed to speak with early on to get licensed to produce food, to get insurance, etc. Then, as the business grew, the challenges became more “everyday” business issues: how to properly manage inventory for a very quickly growing business; how to get new stores interested in the product; how to bring costs down, etc. But those “everyday business issues,” are also what makes running a small business fun. Every day is different; every day you learn something. I was very careful to roll out my product line slowly and deliberately in an attempt to stem the costs (time, energy and money) associated with new product launches. 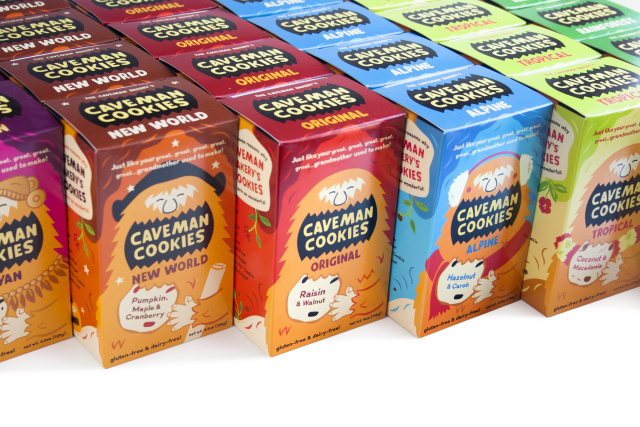 When Caveman Cookies launched, it was with just a single variety (Original), and from there, the product line grew at a rate of just 1-2 varieties per year. The newest (and sixth) variety – Mayan Caveman Cookies – is being introduced just this month; nearly one year after the last flavor, New World Caveman Cookies. Given how much effort goes into introducing new products (from the development stage, to testing, to creating new packaging, to shooting photos and promoting the new variety), I have developed a new-found appreciation for any new product that any business (large or small) puts out there! For the Caveman Bakery, I would say that each variety took about 3-4 months to develop, and between $5000 to $10000 to complete (and I have a feeling I’m doing it cheaply!). However, by waiting a significant period of time between each new launch, I was able to keep my time, energy, and money focused on growing the Bakery. Given the phased roll-out of varieties and the ability to use a copacker for production (i.e., not having to invest in a factory), I have been able to grow the business without outside financing. 5. Please share your insights and advice for new to industry companies. 1. Money– Be prepared not to make any money for awhile; at least 3-4 yrs. From my own experience, and from the entrepreneur grapevine, my understanding is that this is standard; don’t expect to be the exception! 2. Packaging– Think long and hard about the packaging you want: what net weight it should be; what information you want on your packaging; what final price the unit will retail for, etc. This will save you a lot of time, money and energy down the road. I don’t even want to think about all the money I lost in packaging changes over the years, which could have been prevented by more careful planning early on. 3. Making friends– Meet your fellow entrepreneurs! They can be a wealth of information, a great repository for hilarious “newbie” stories, and/or simply an outlet for sharing frustrations to someone else who understands. Don’t underestimate how worthwhile meeting your fellow entrepreneurs can be. My main goal over the next 5-10 years is to grow distribution. 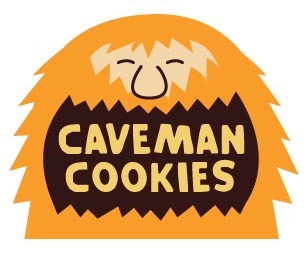 Caveman Cookies are readily available on the East Coast, but more sparsely available throughout the rest of the US. I’d like to grow that distribution significantly over the next few years. International distribution is another area I am looking at closely. While the cookies are already available in Canada, the UK, Australia, a few countries in Europe, and Kuwait — I am looking to expand exports generally as Paleo becomes increasingly popular beyond the US. More information about Caveman Cookies can be seen at: www.cavemancookies.com.